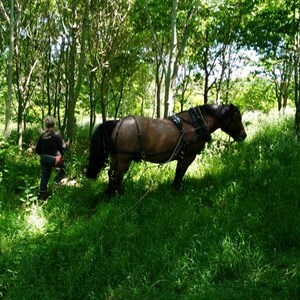 June 2013 - 1st visit, arranged and paid for by the Woodland Trust. 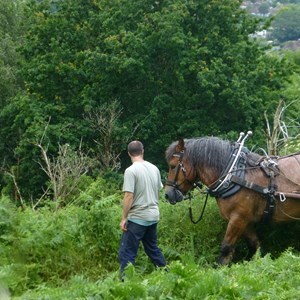 The Woodland Trust had concerns about the spread of bracken on the hill as it has no natural predator to control it. 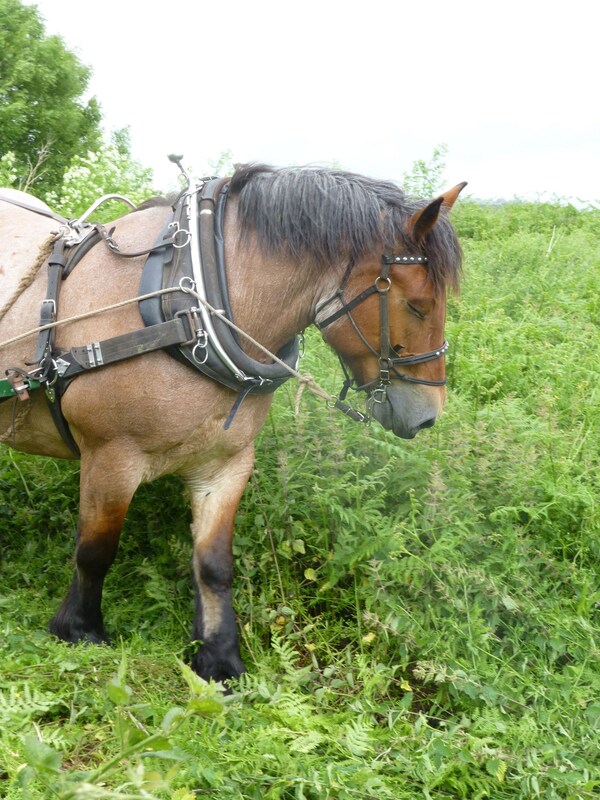 There had also been a huge rise in the number of ticks, which is about the only thing on the hill that directly benefits from the dense bracken growth, and which are not pleasant for any animal or human, with the potential of carrying Lyme disease. 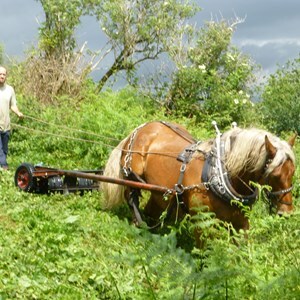 With so many complex habitats on the hill at threat from the spread of the bracken, an eco-friendly way of controlling it was needed. 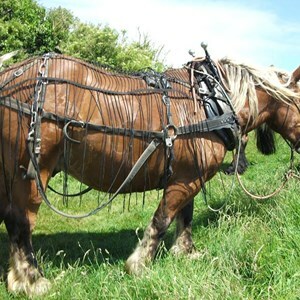 Total eradication is impossible due to the lie of the land. 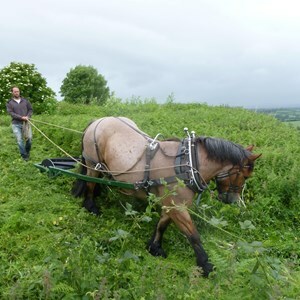 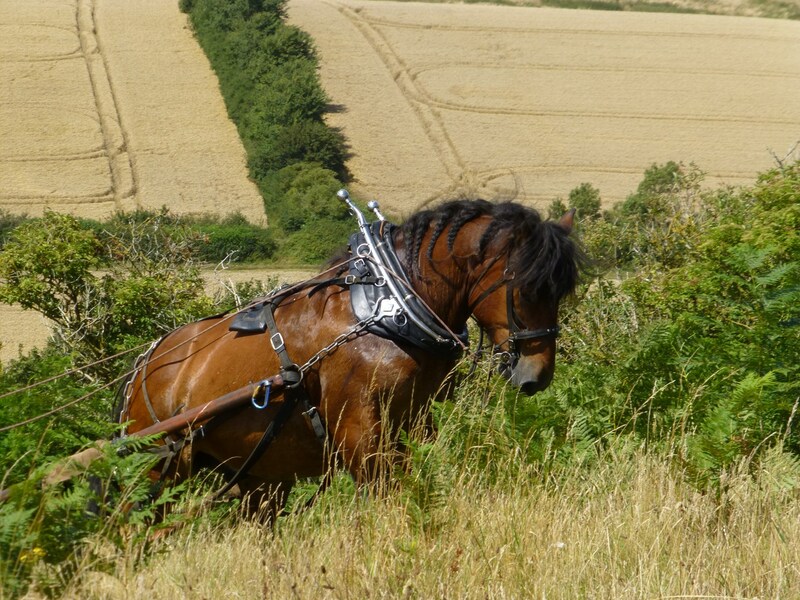 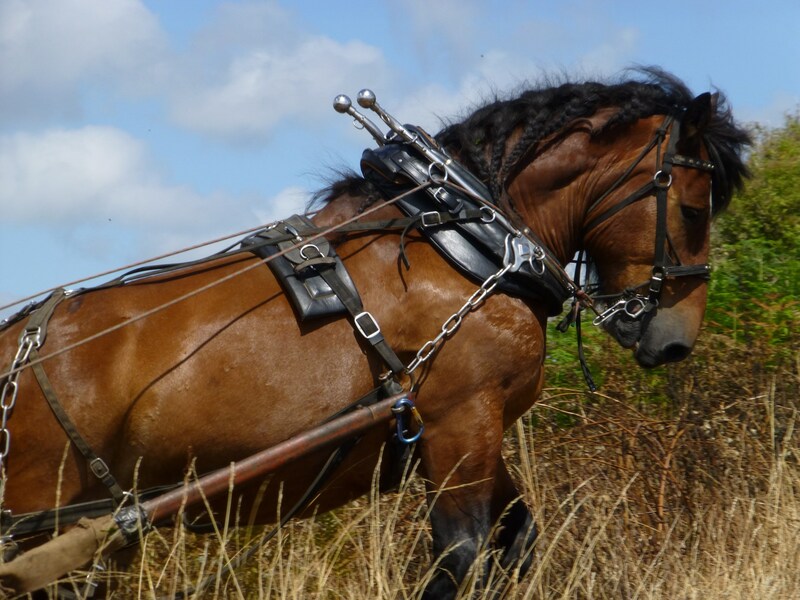 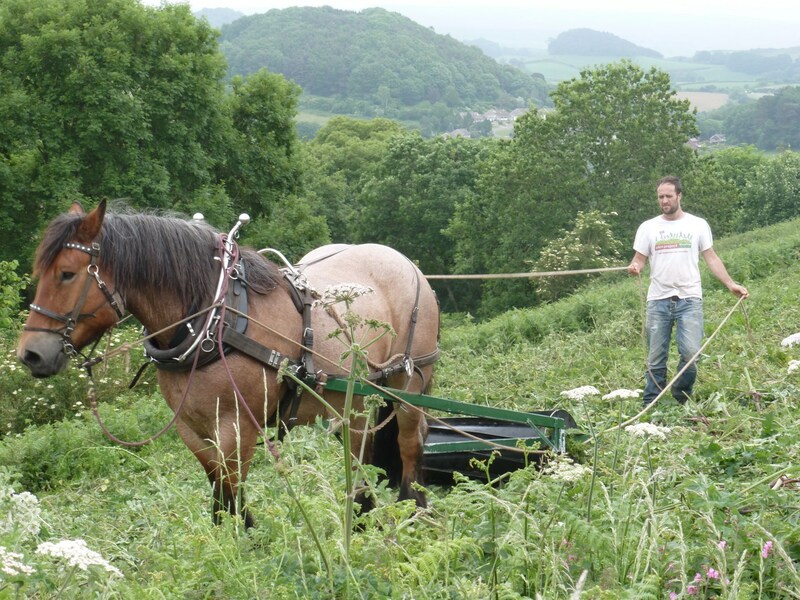 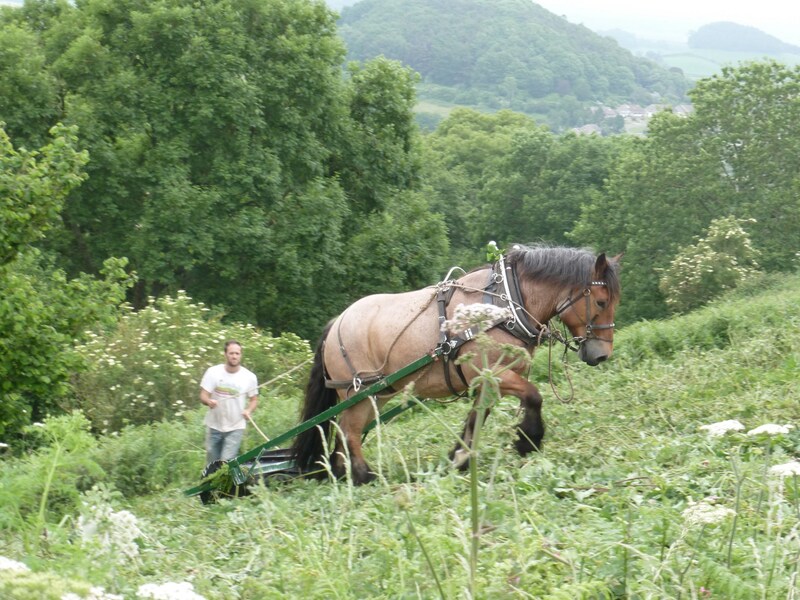 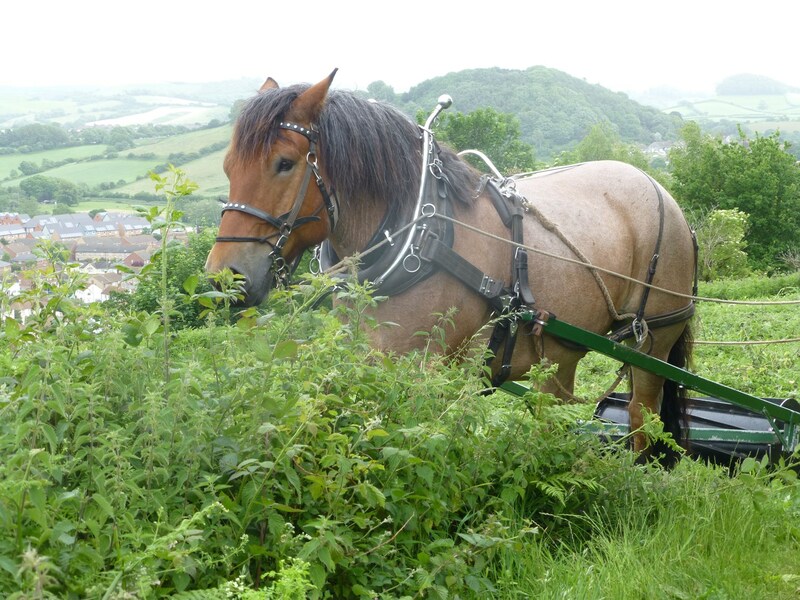 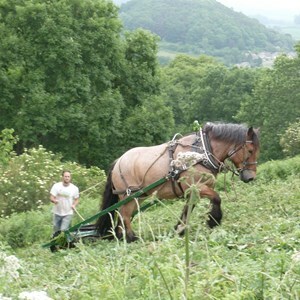 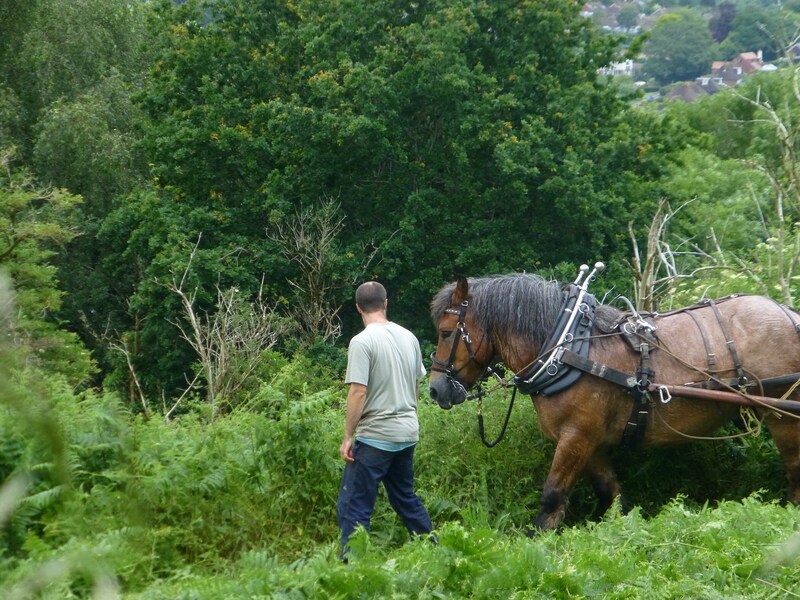 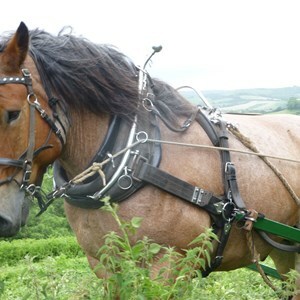 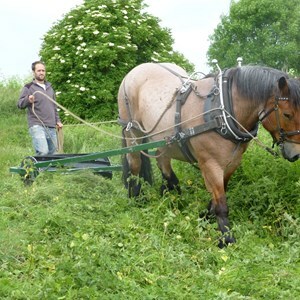 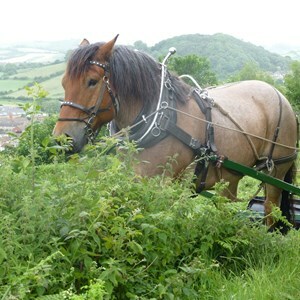 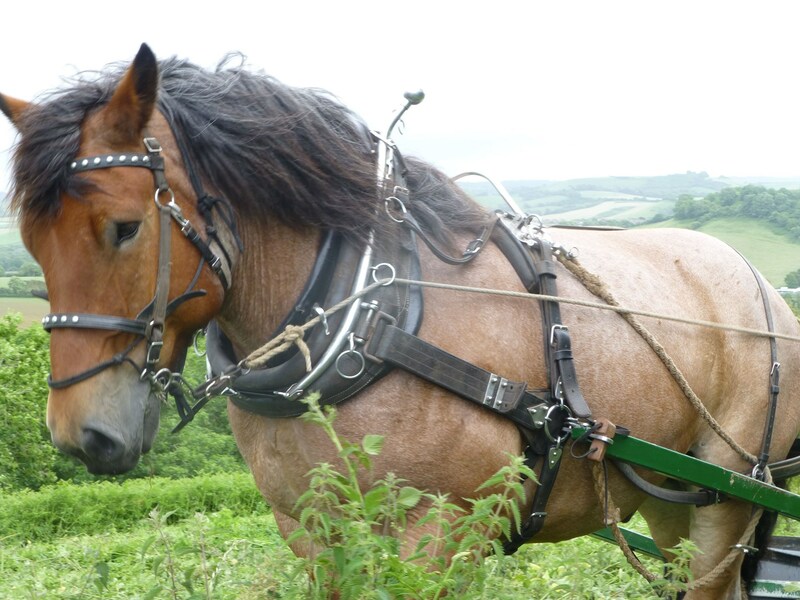 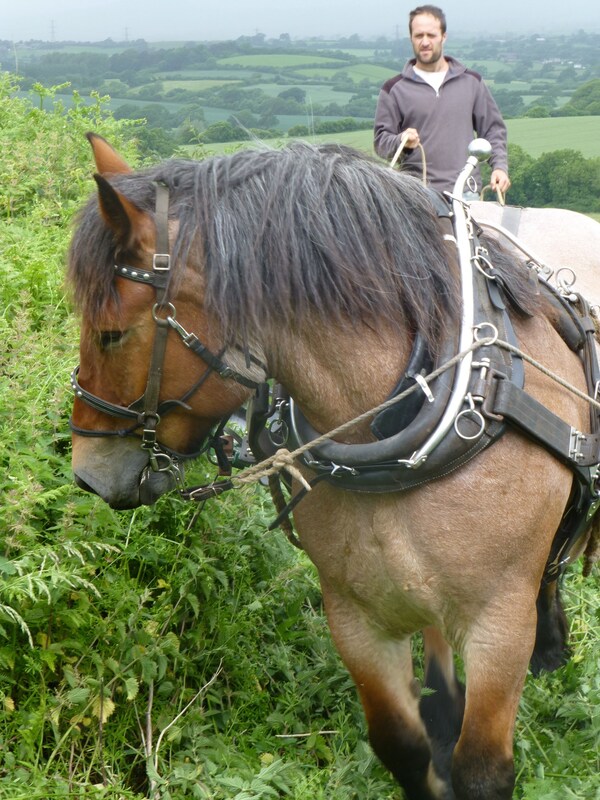 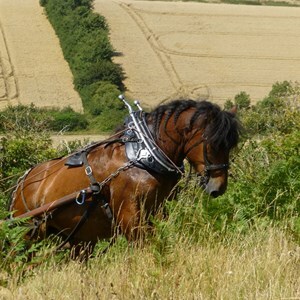 Using horse power to pull a bracken roller shreds the stem of the bracken. 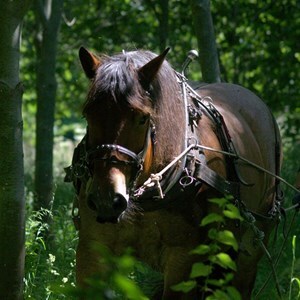 The toxins in the sap feed back down to the roots and this weakens the plant. 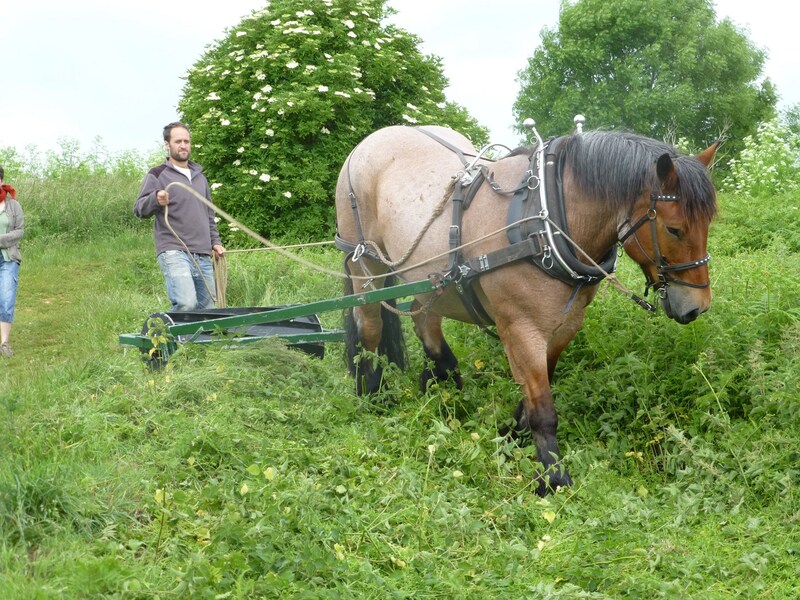 This process will have to be repeated for three or four years, by which time other plants will have been given the chance to get a hold. 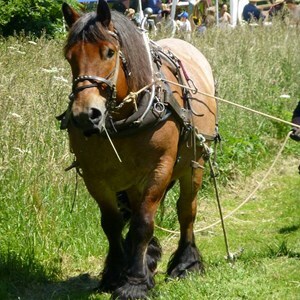 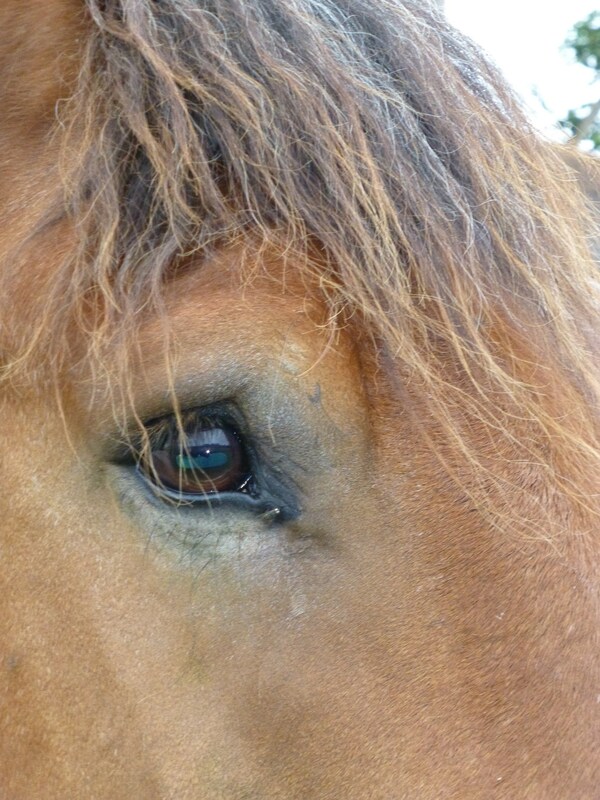 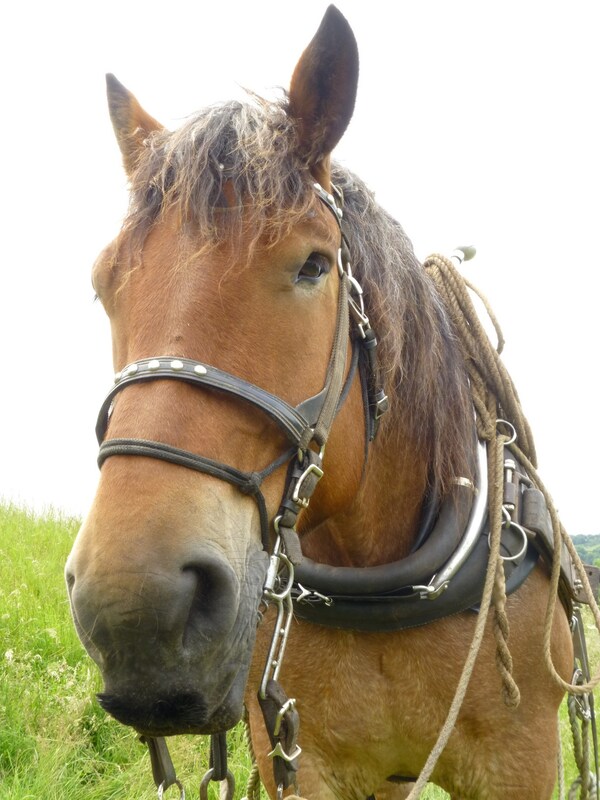 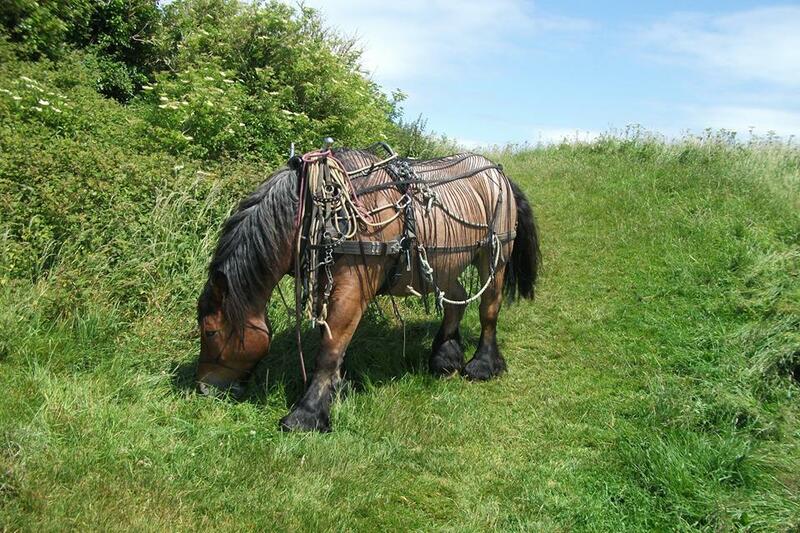 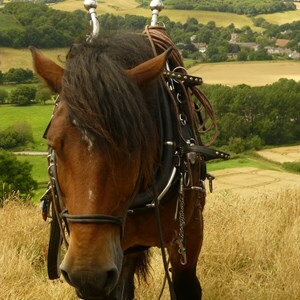 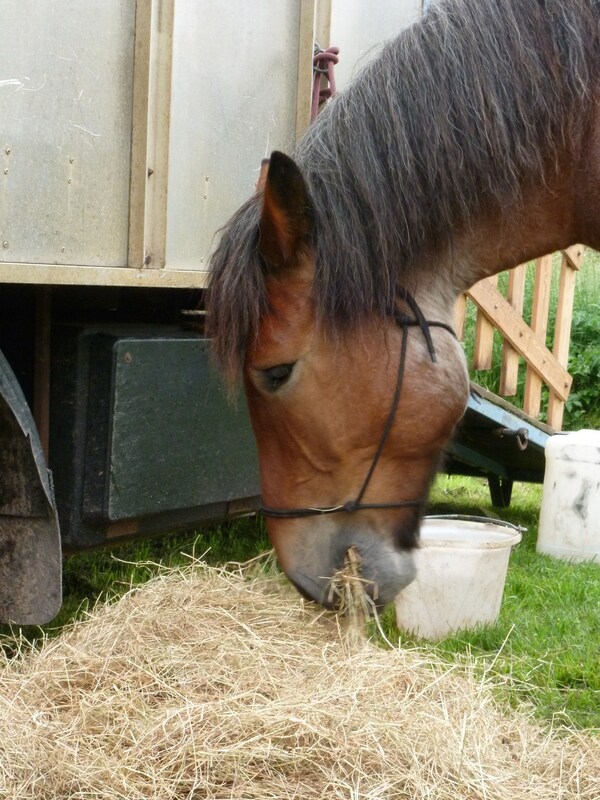 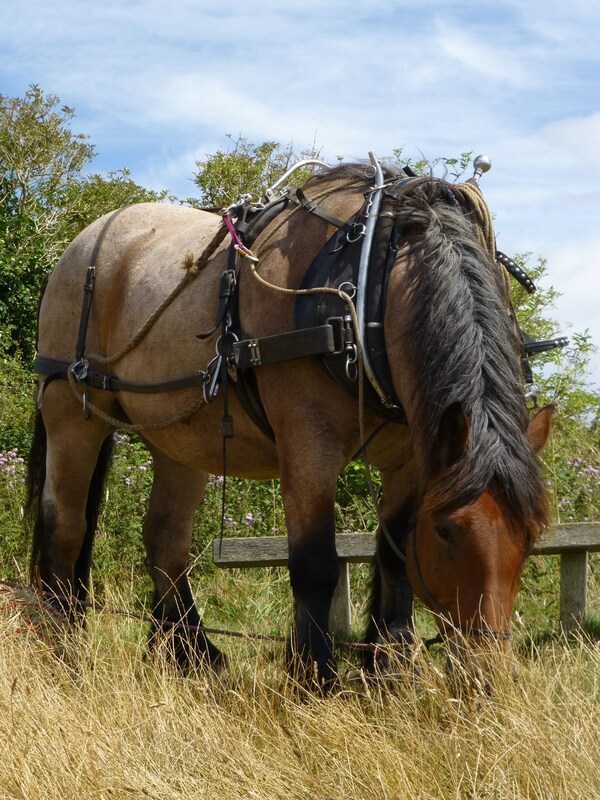 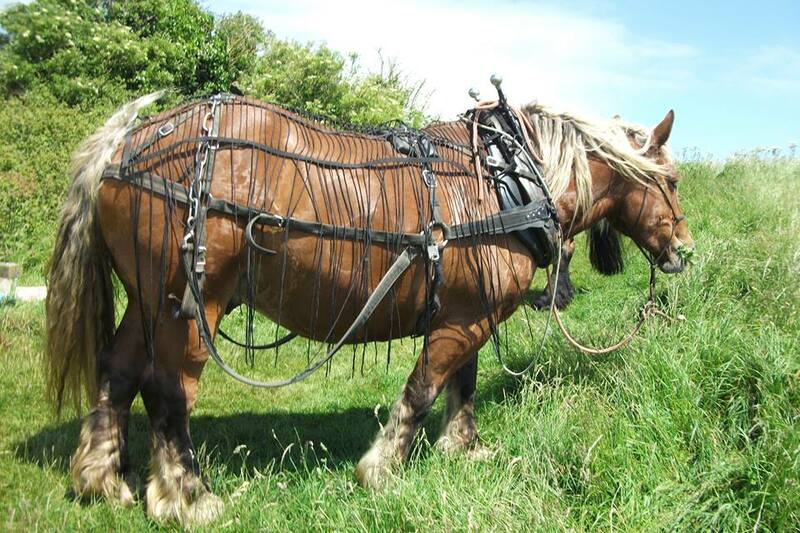 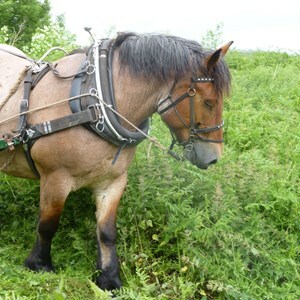 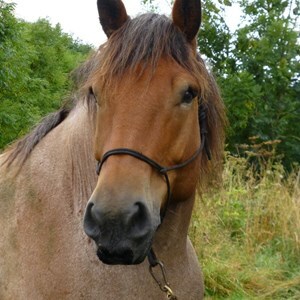 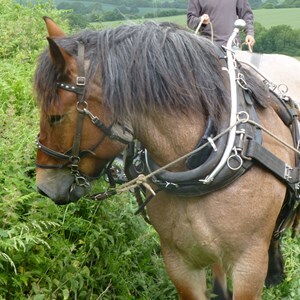 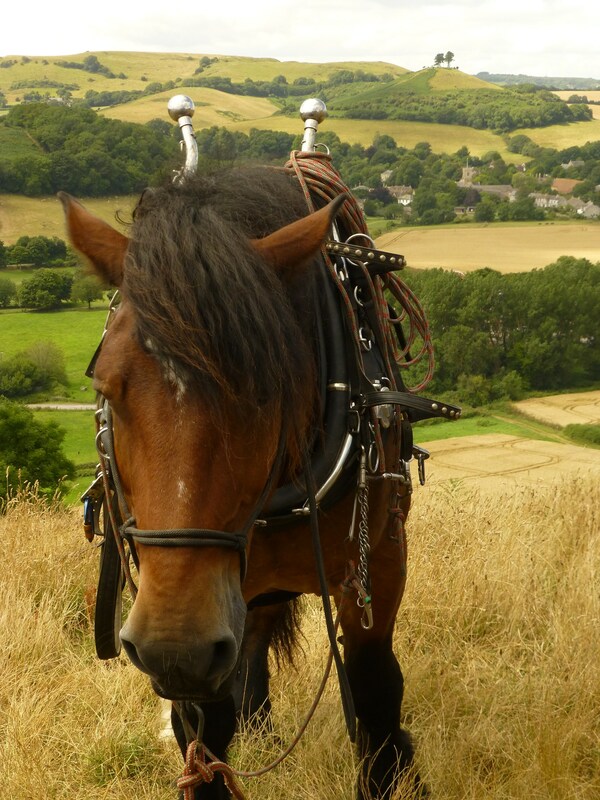 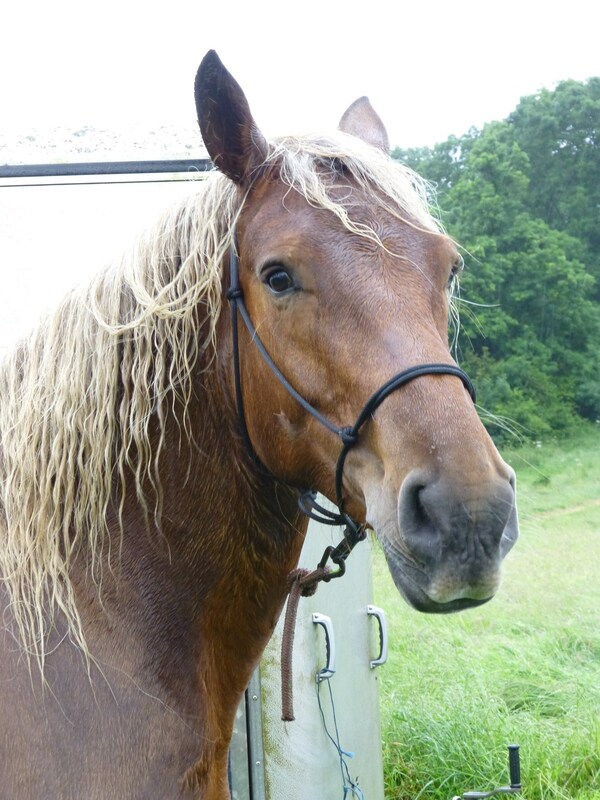 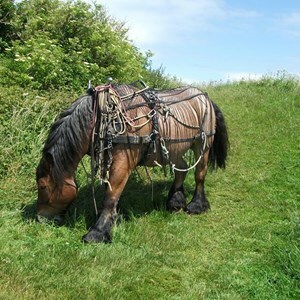 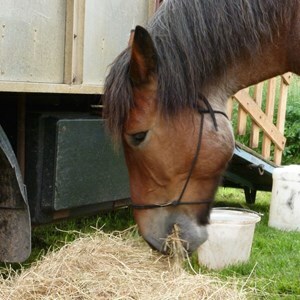 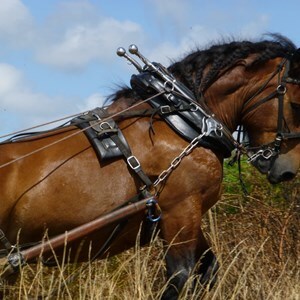 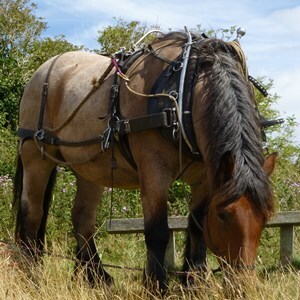 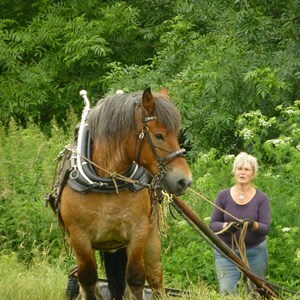 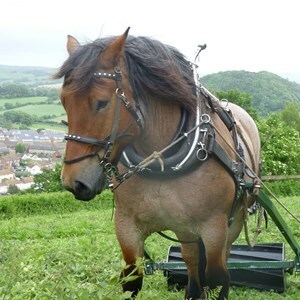 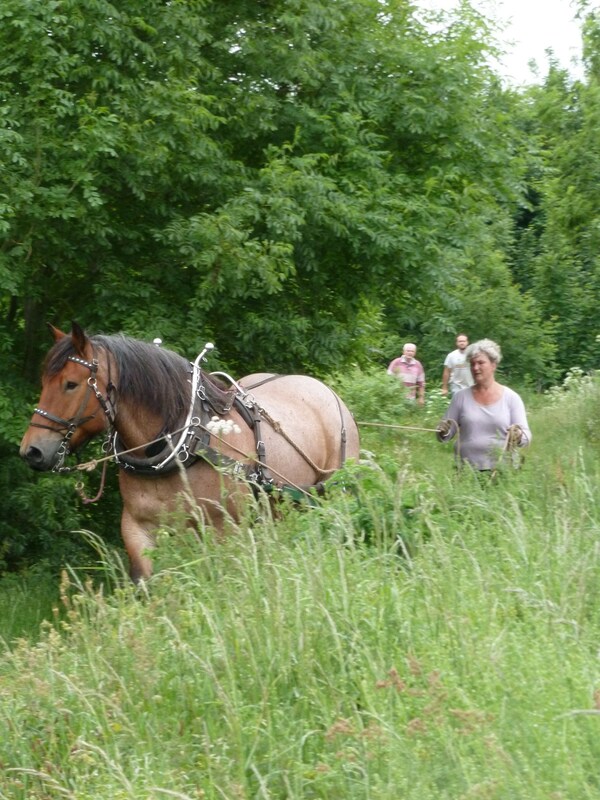 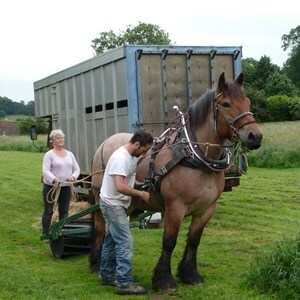 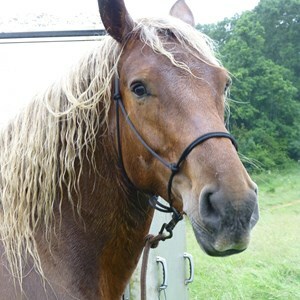 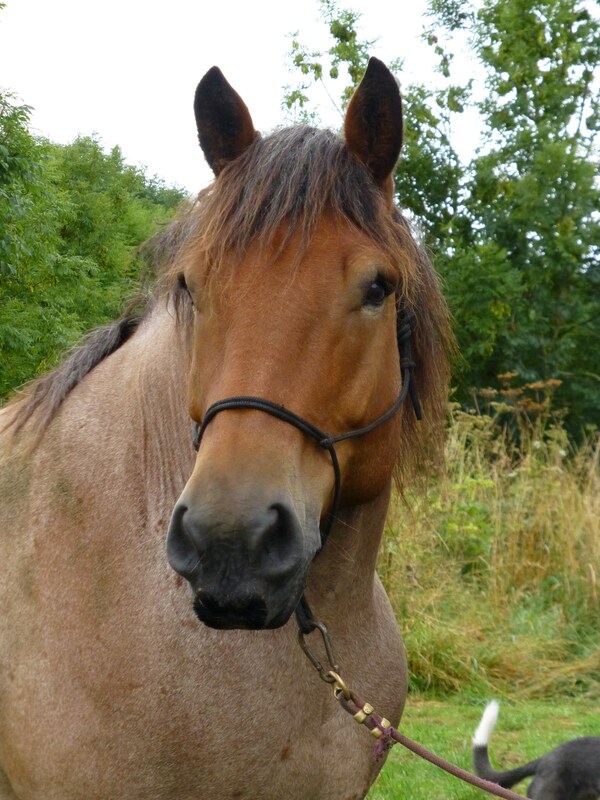 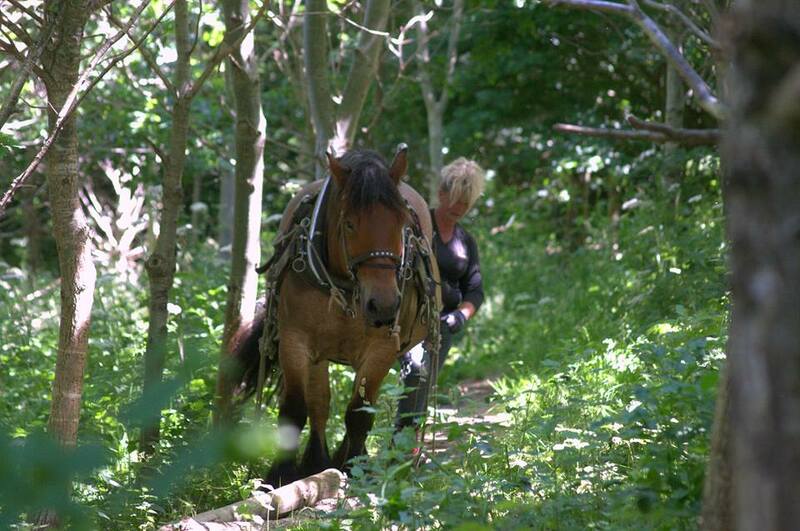 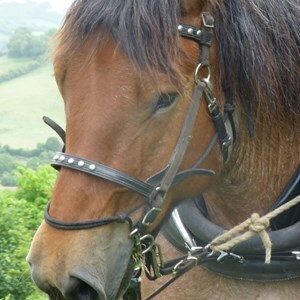 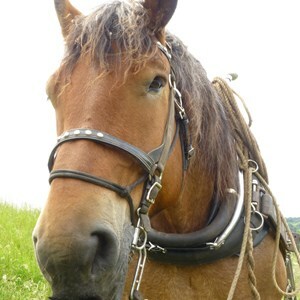 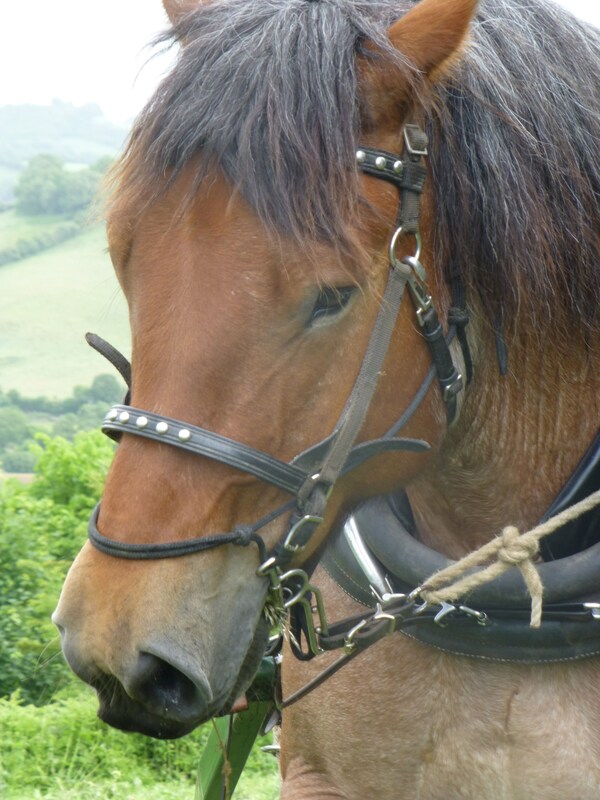 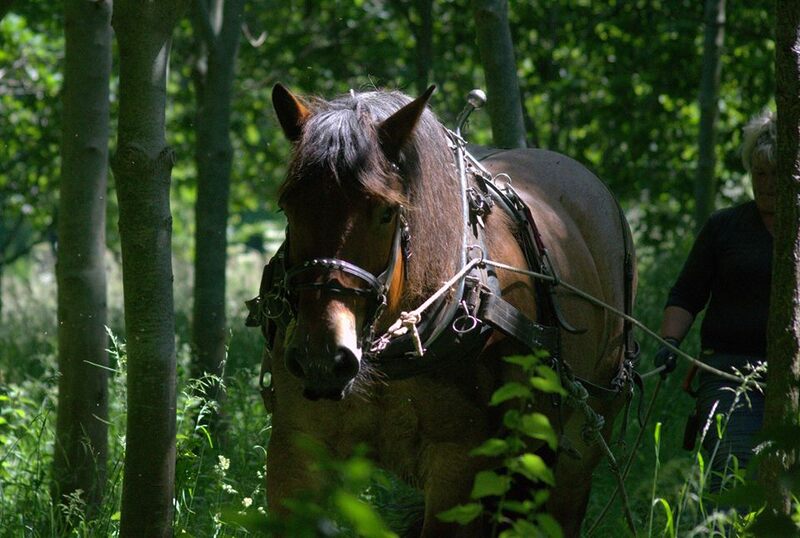 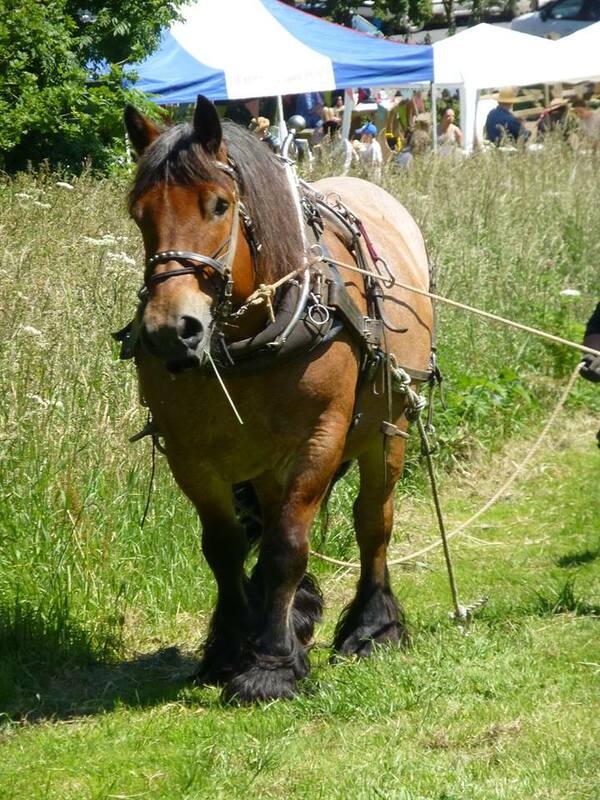 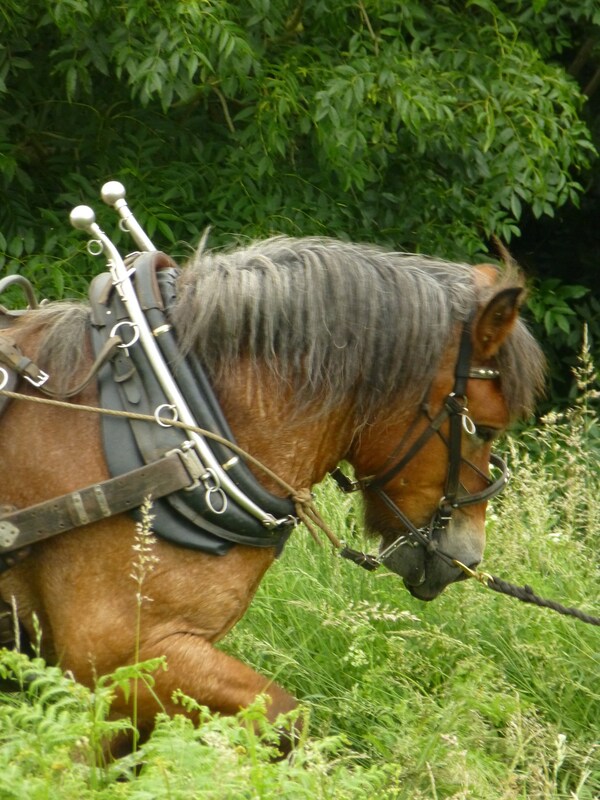 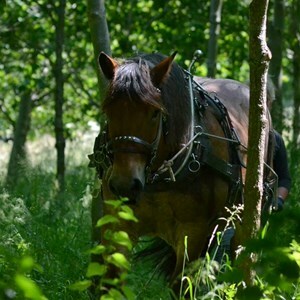 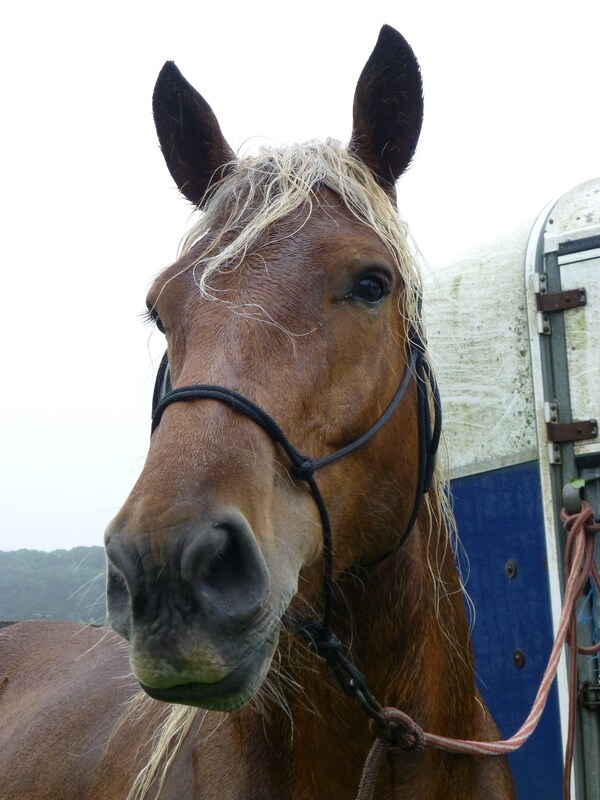 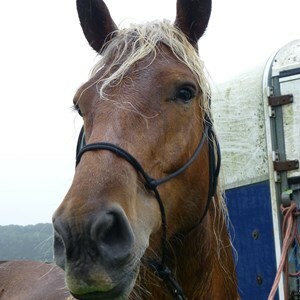 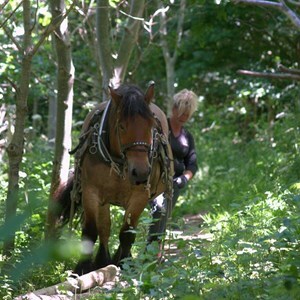 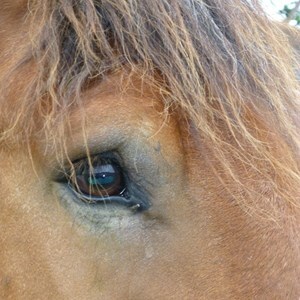 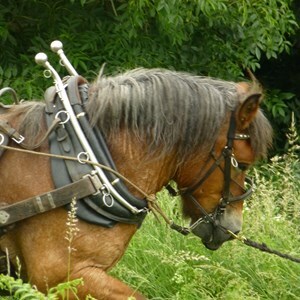 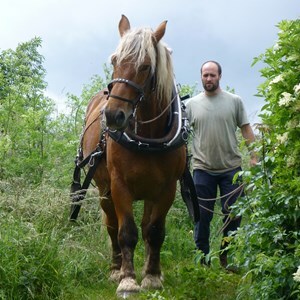 Kate’s horse Kipp is trained to do most forestry work and is a gentle giant. 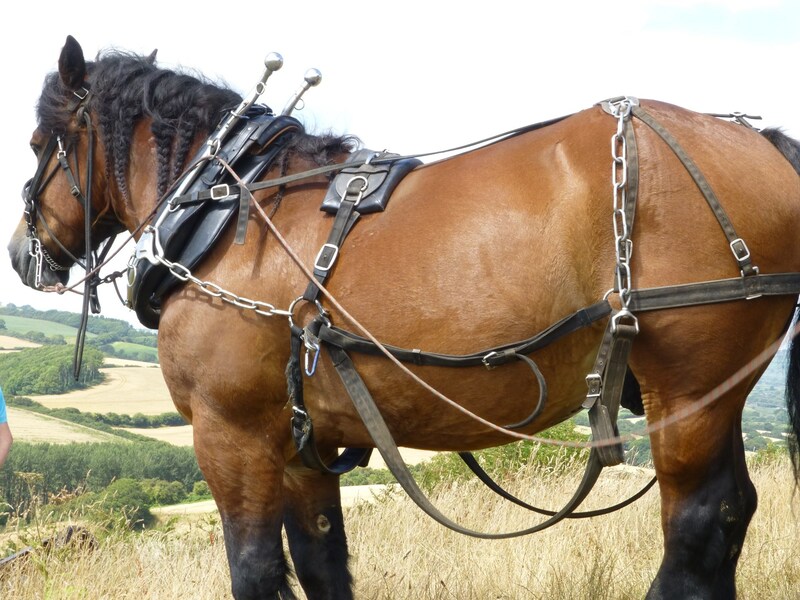 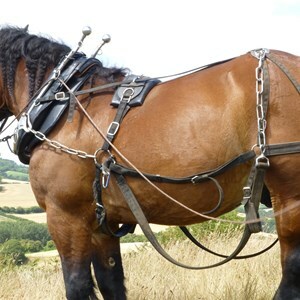 The Ardennes breed was the horse mostly used during WW1, for its strength and sturdiness. 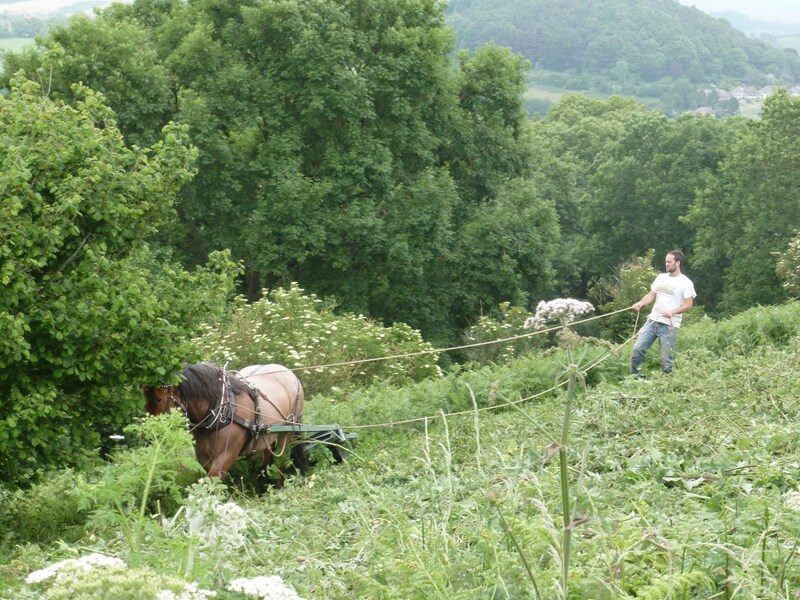 Kipp worked for about 45 minutes before having a 15 minute break, working throughout the day. 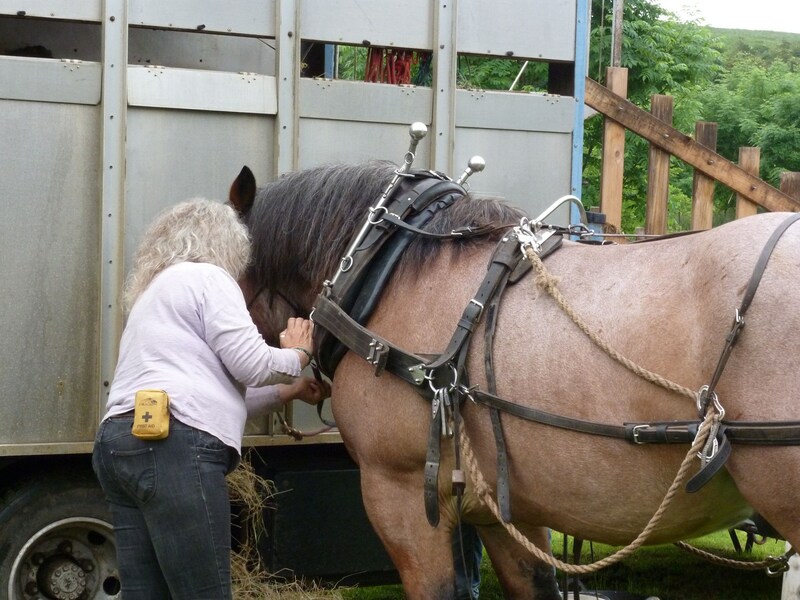 Kate lets Kipp tell her when he has had enough and never pushes Kipp to complete an eight hour day. 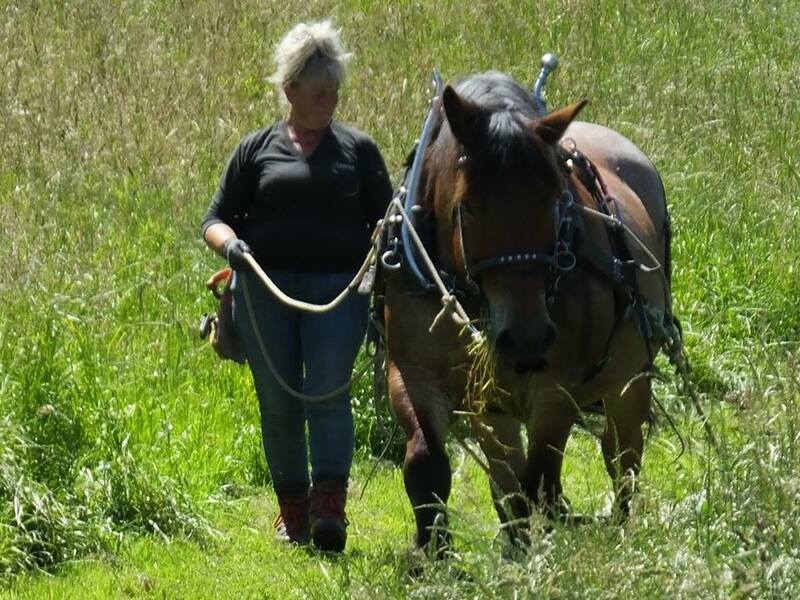 I’m sure a few of us would like a boss like that! 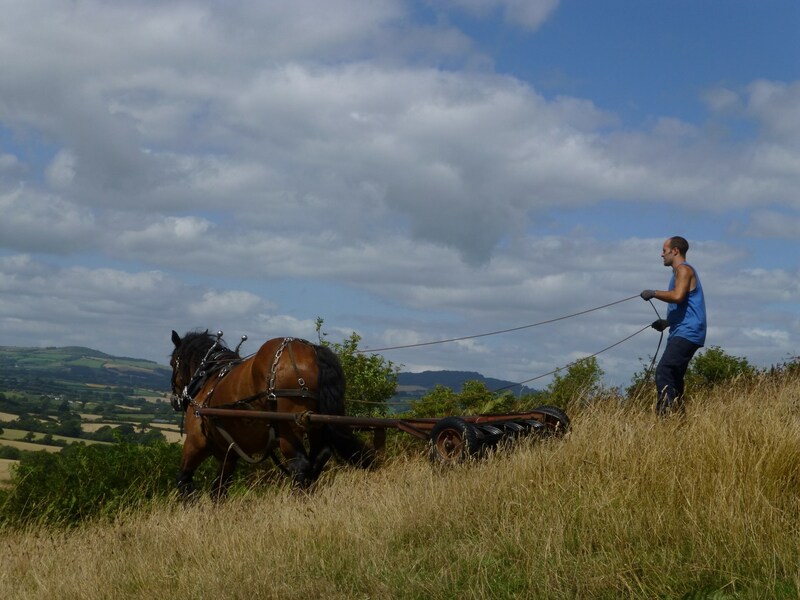 Kate had Will to help lead Kipp around the hill. 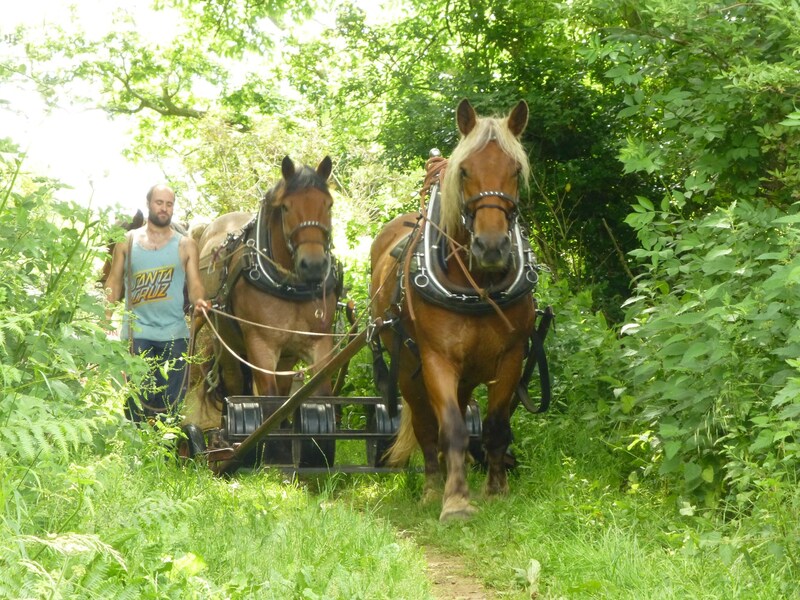 They must have walked a good few miles between them during the day. 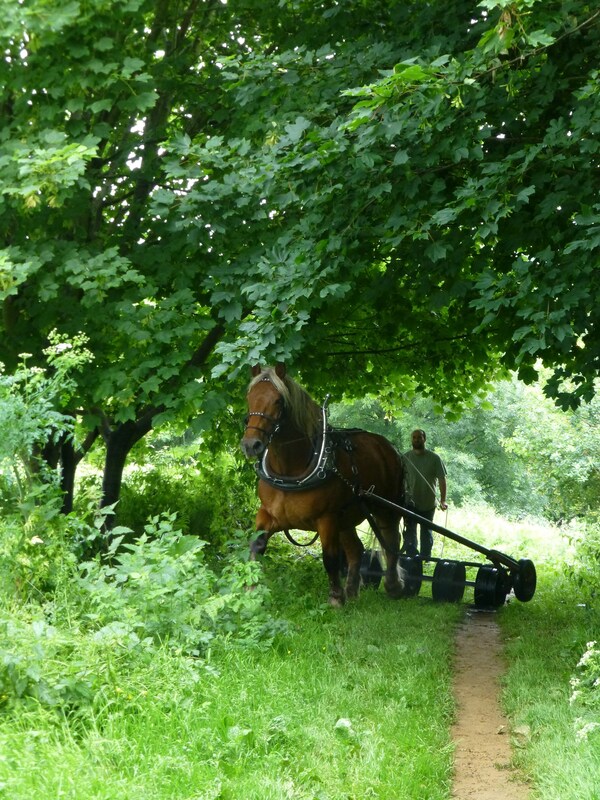 August 2015 - 2nd visit, arranged and paid for by the Woodland Trust. 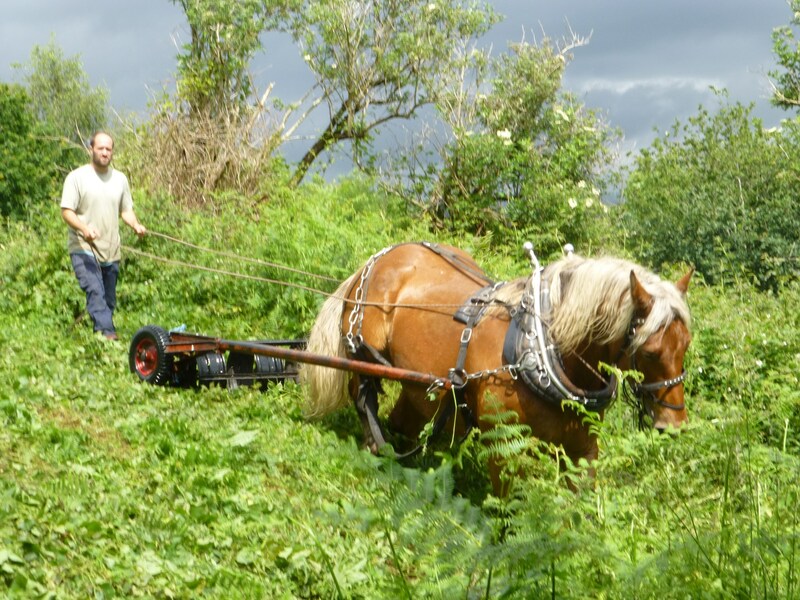 Unfortunately, after John Burgess, our Woodland Trust manager, moved on, the bracken bashing was not done in 2014, despite having been promised. 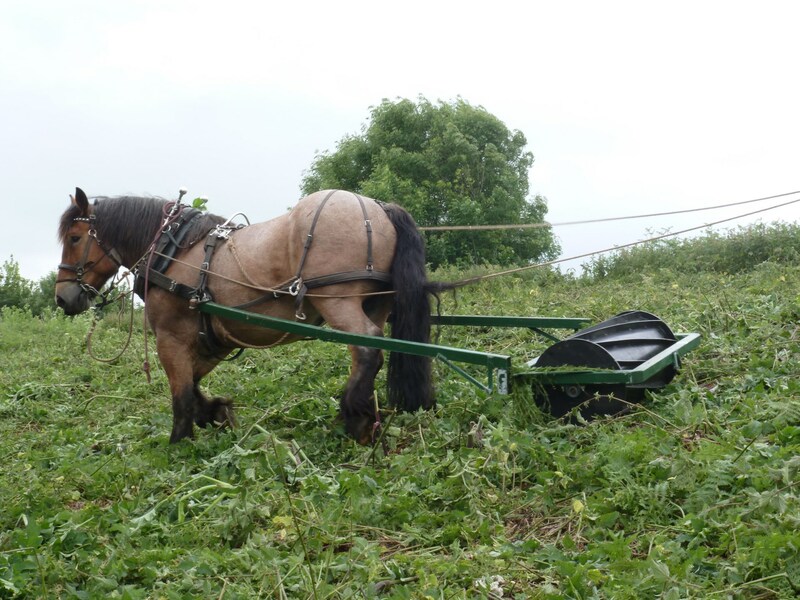 But it was done in 2015. 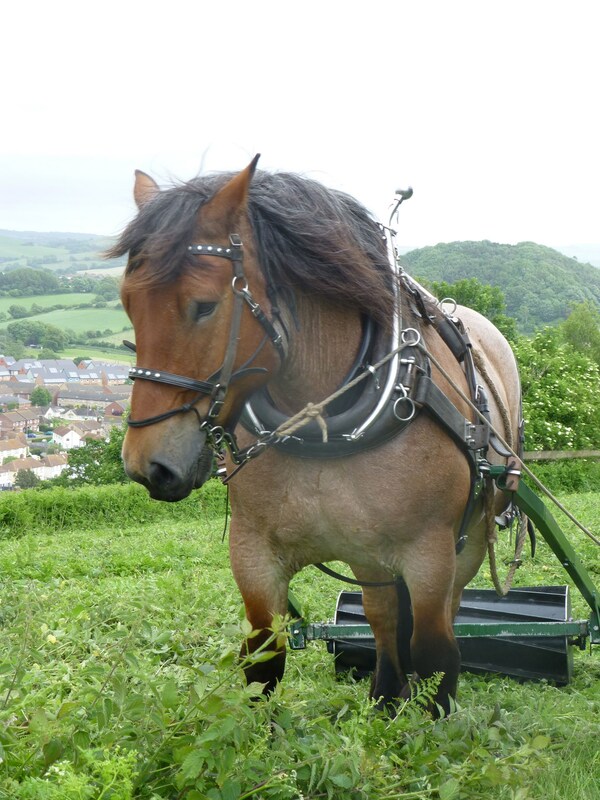 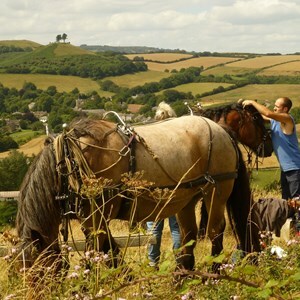 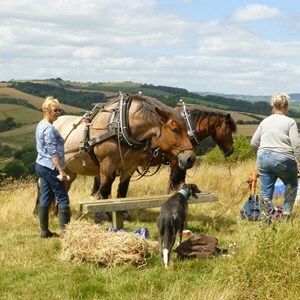 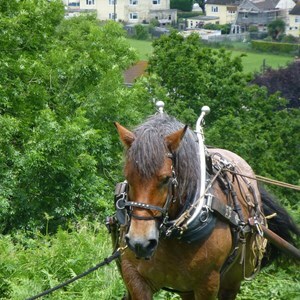 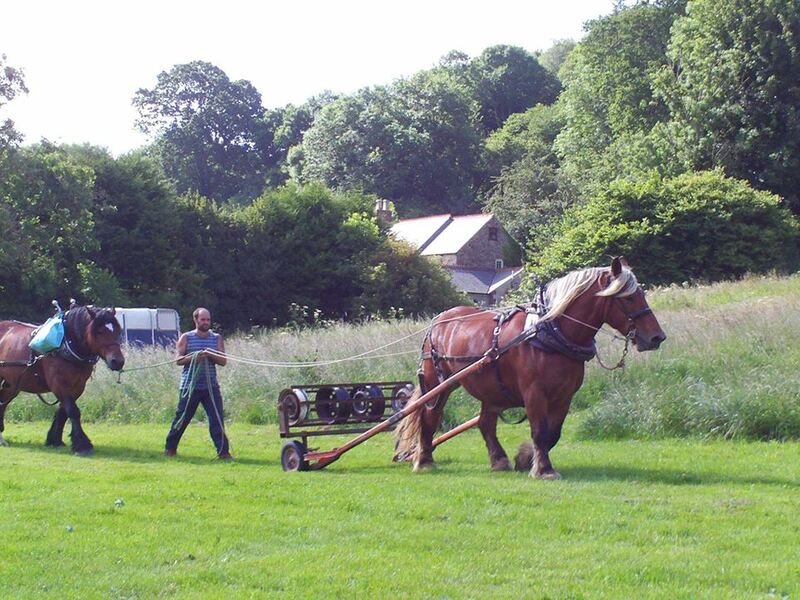 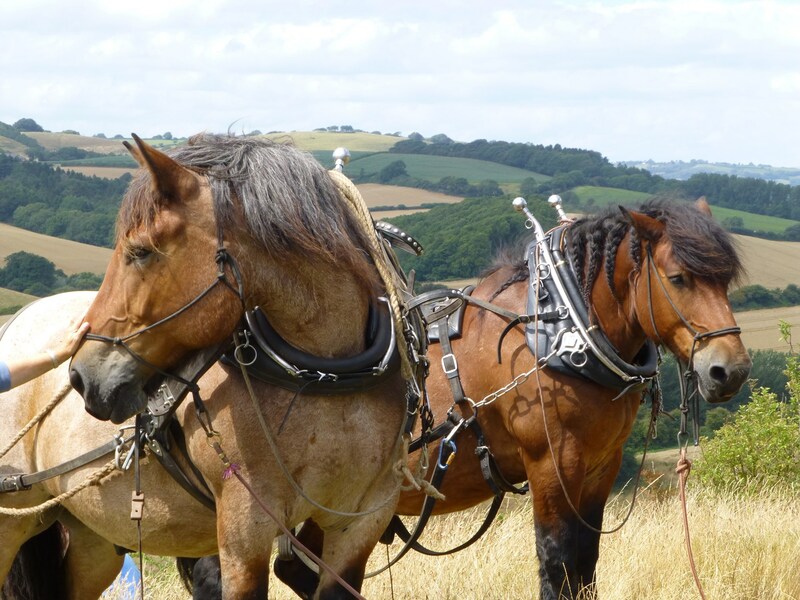 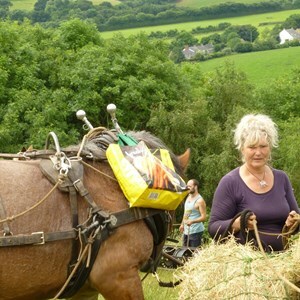 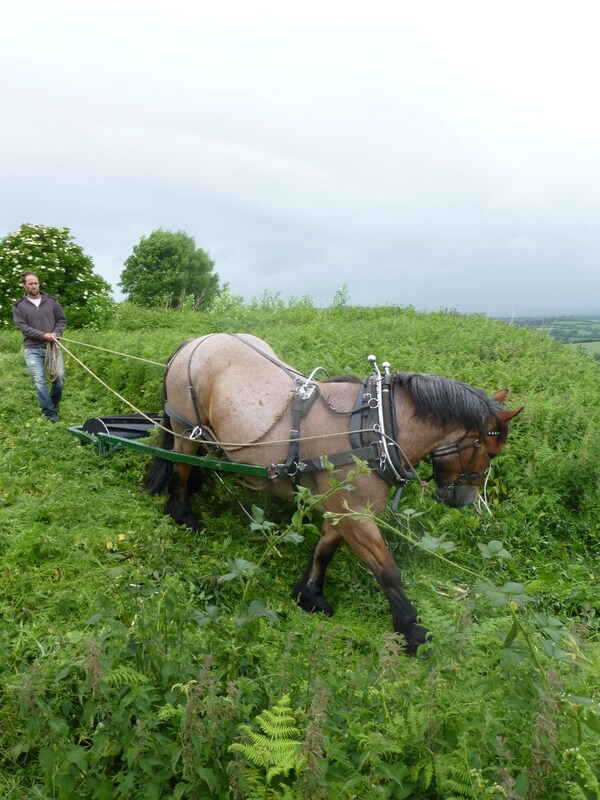 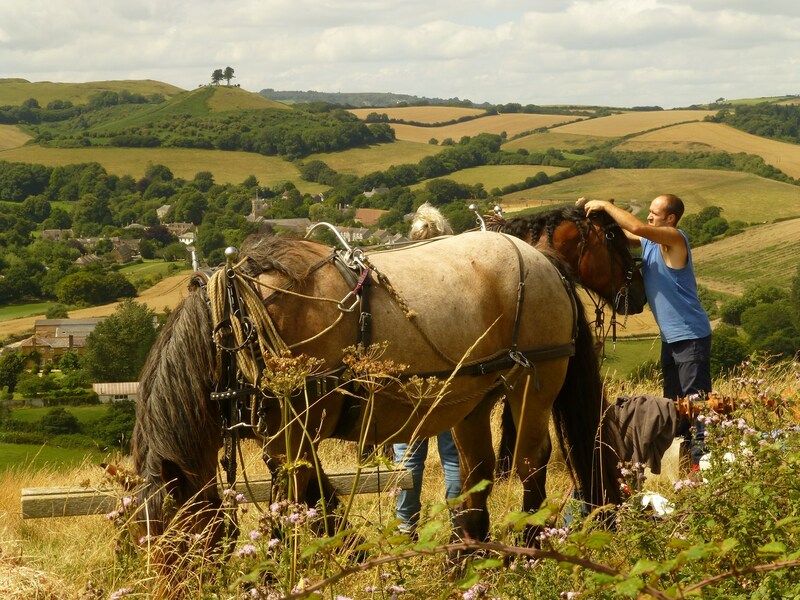 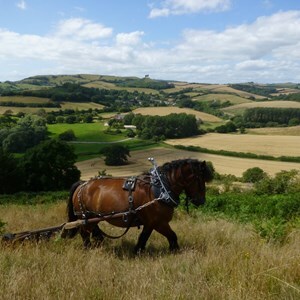 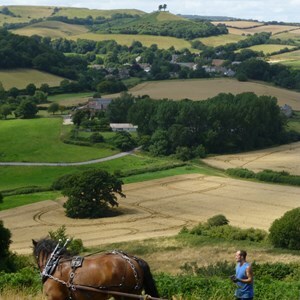 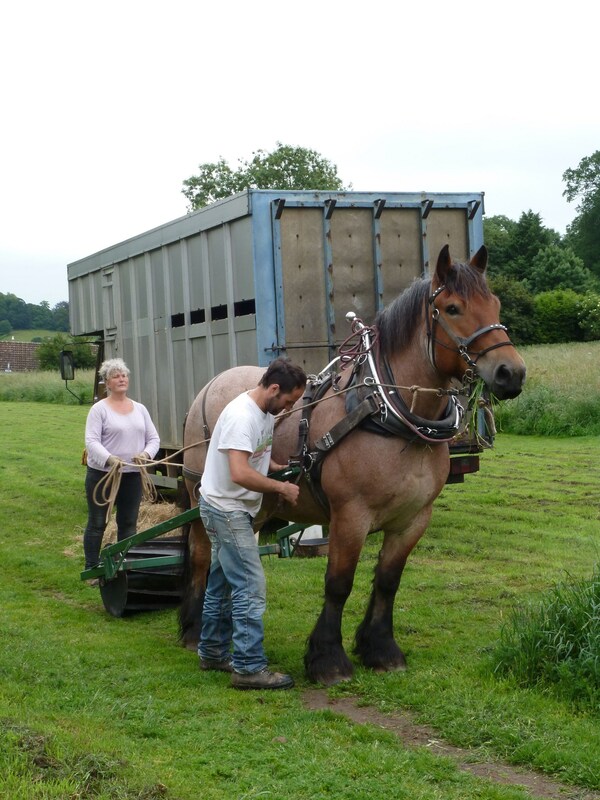 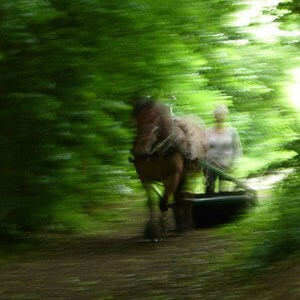 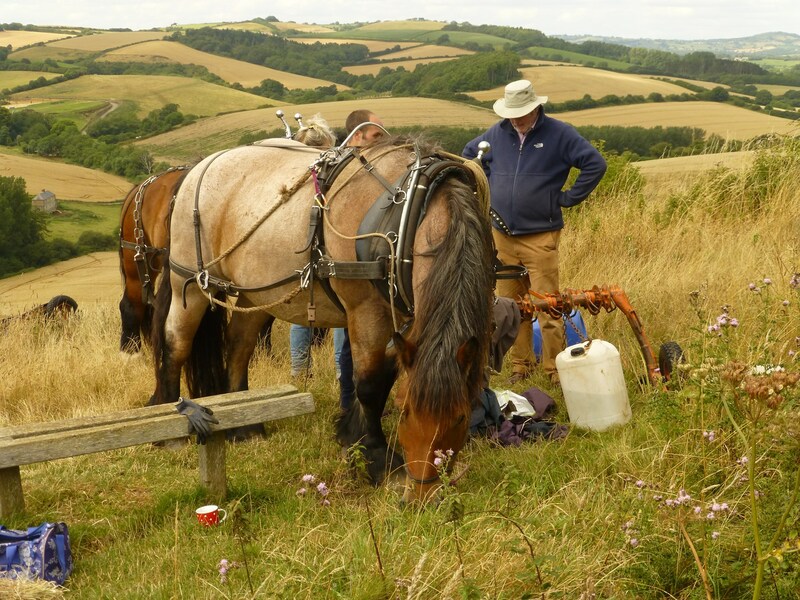 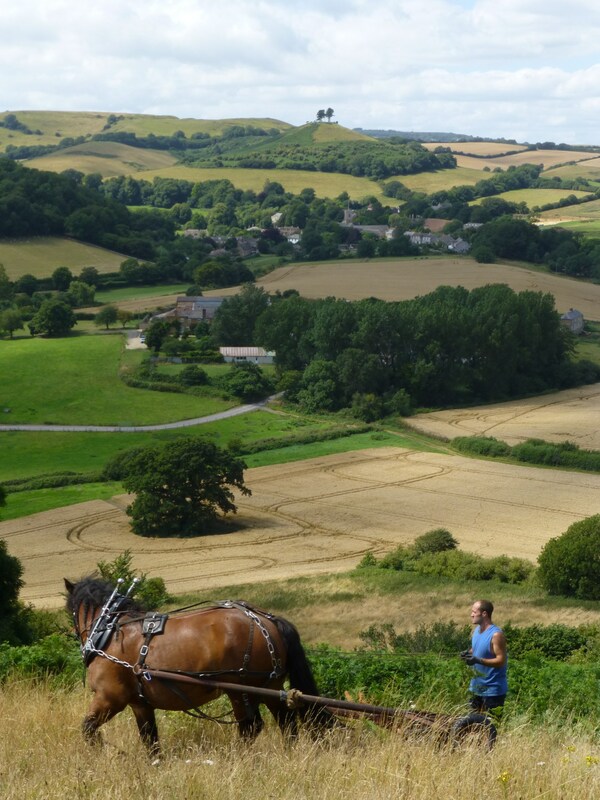 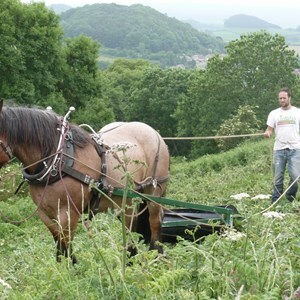 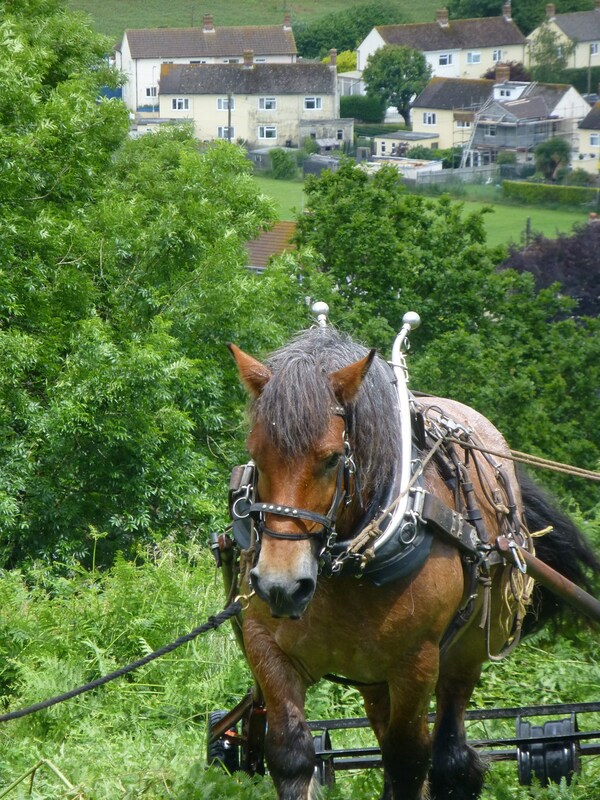 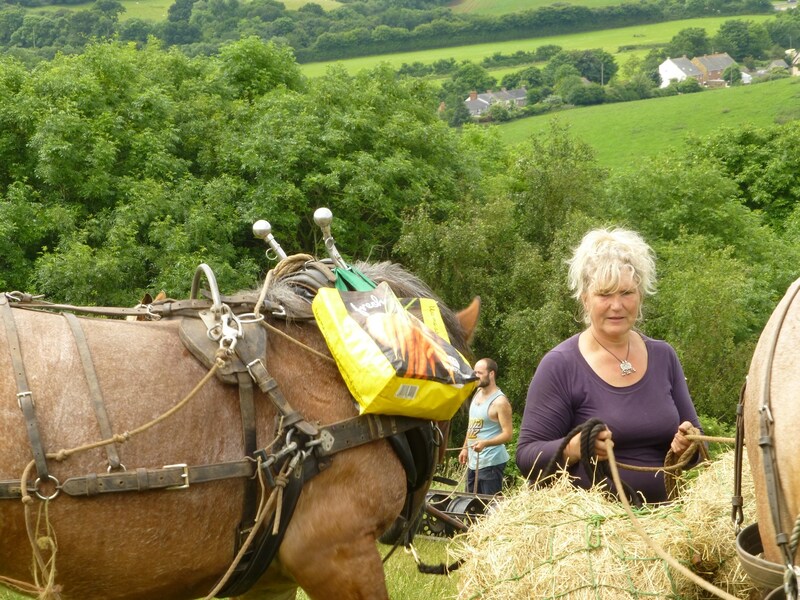 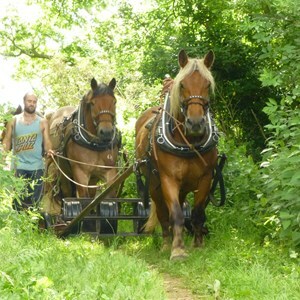 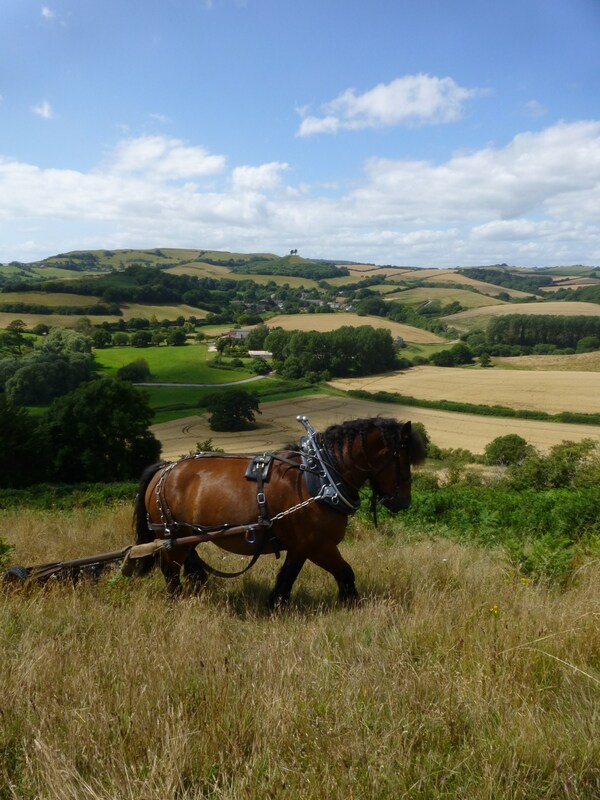 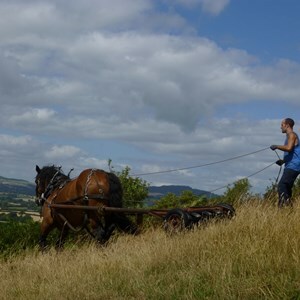 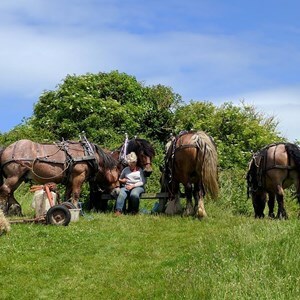 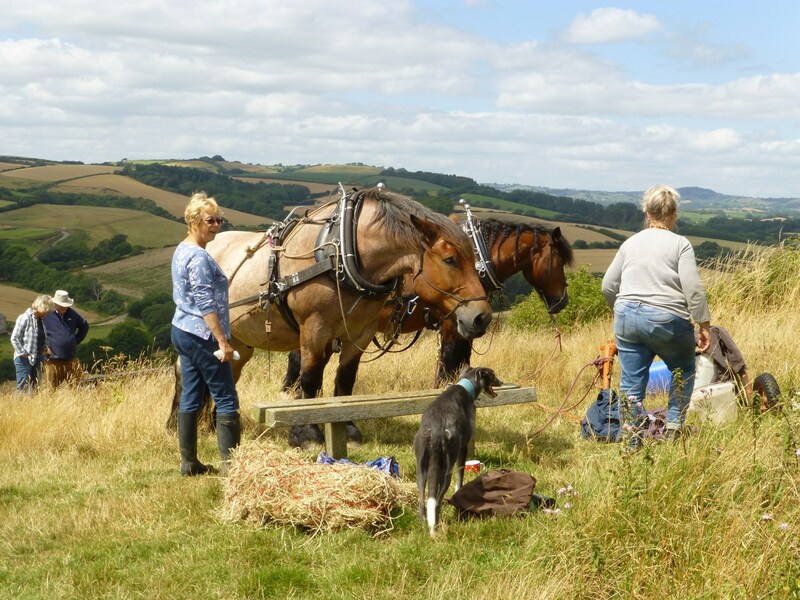 Kate and Will brought there horses Kipp and William (half brother to Kipp) and spent 2 days rolling bracken. 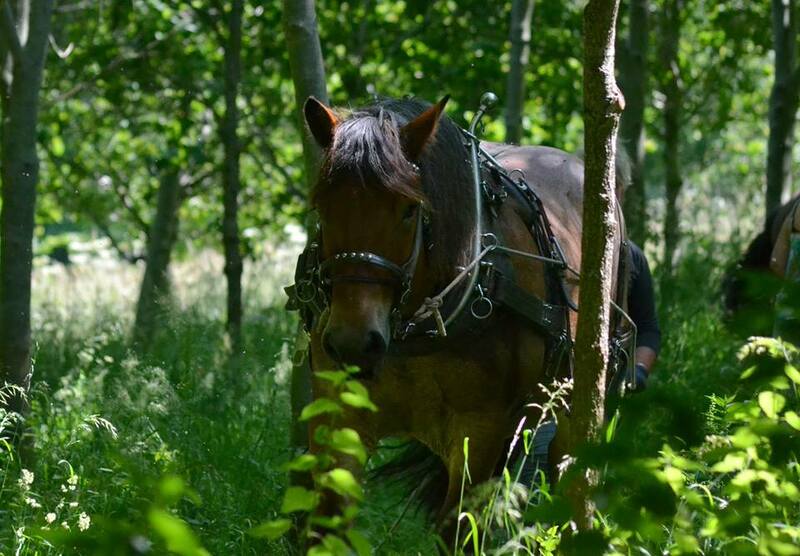 June 2016 - 3nd visit, arranged and paid for by the Woodland Trust. 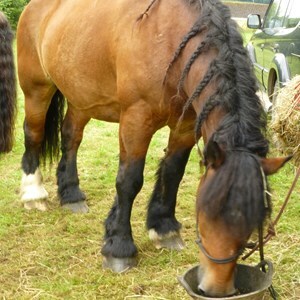 This time Kipp was joined by Beono and Solo. 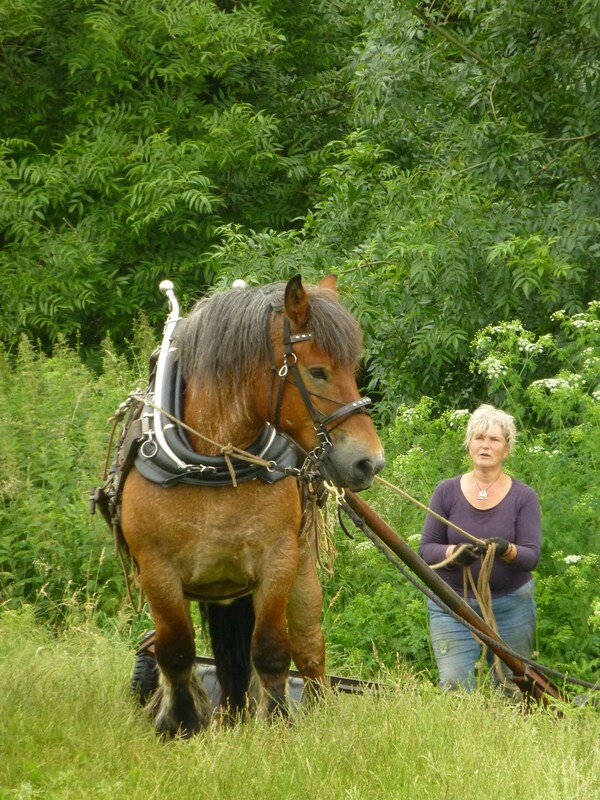 June 2017 Visit, arranged and partly paid for by us. 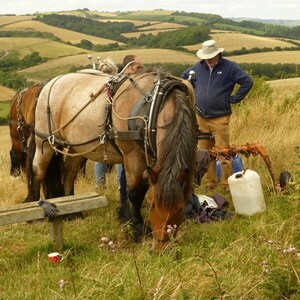 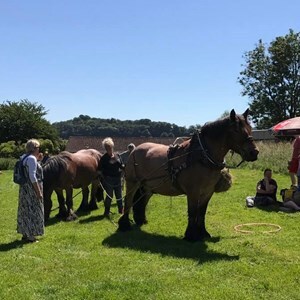 This year we were invited to link up with Bridport Museum's Heritage events and the Bridport Food Festival. 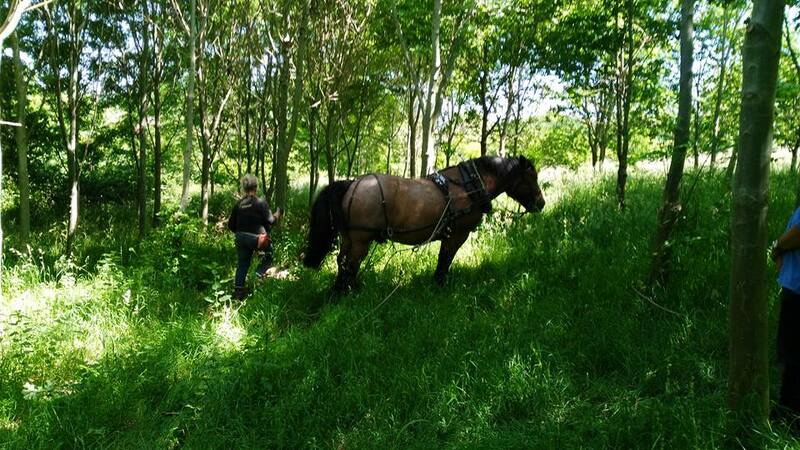 It seemed the perfect opportunity this year to ask Kate to stay and help us remove timber from Cooper's Wood. 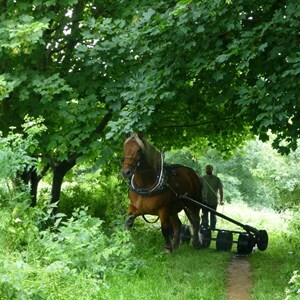 Many would argue that this was not a cost effective way to remove the timber, but it is not always about the money. 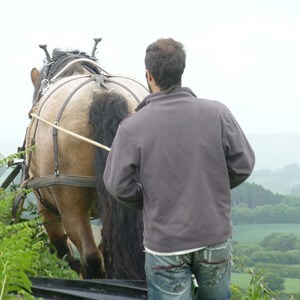 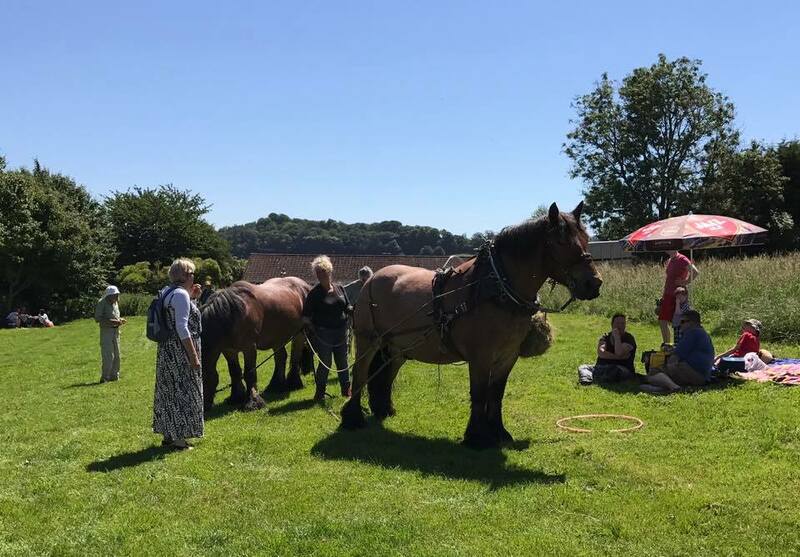 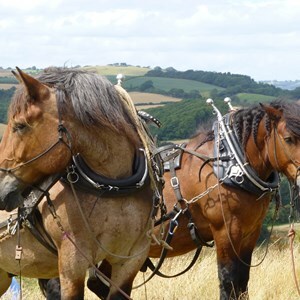 We were able to sell the timber that we had extracted and the horses were able to work within the wood where vehicles are unable to reach. 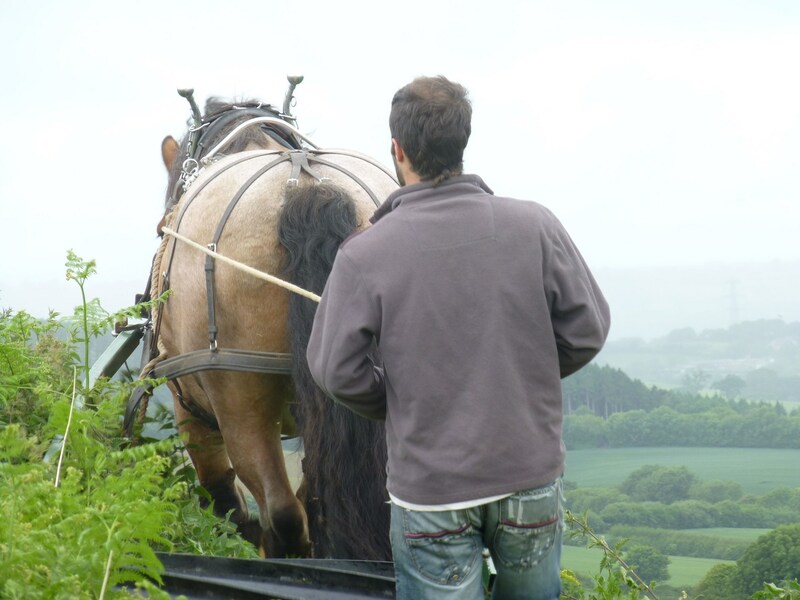 Last year we had to log the wood on site and physically carry it out. 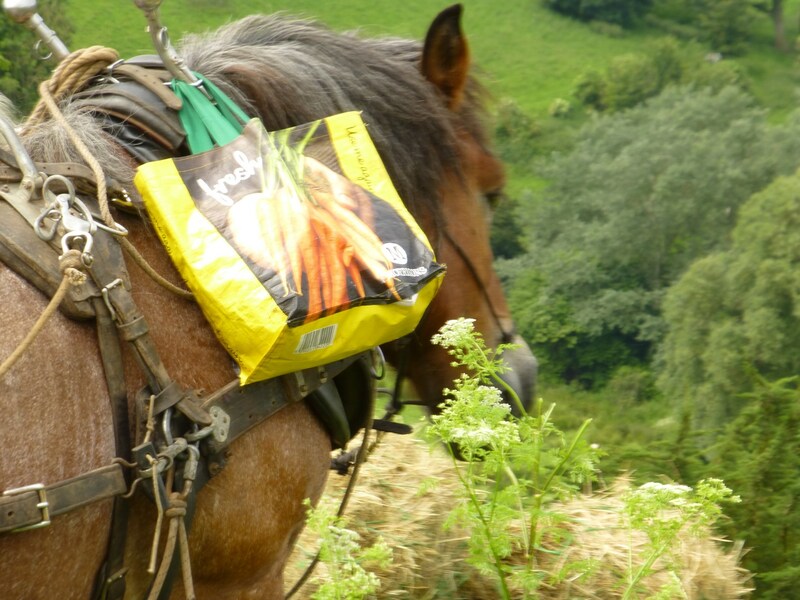 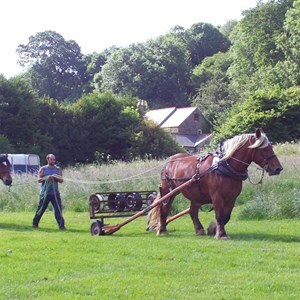 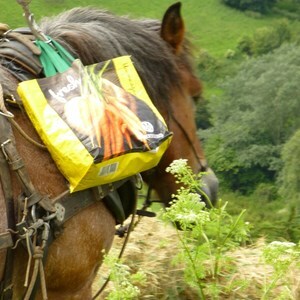 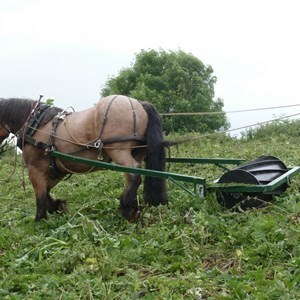 Kate was also very keen to promote a traditional heritage way of working the land. 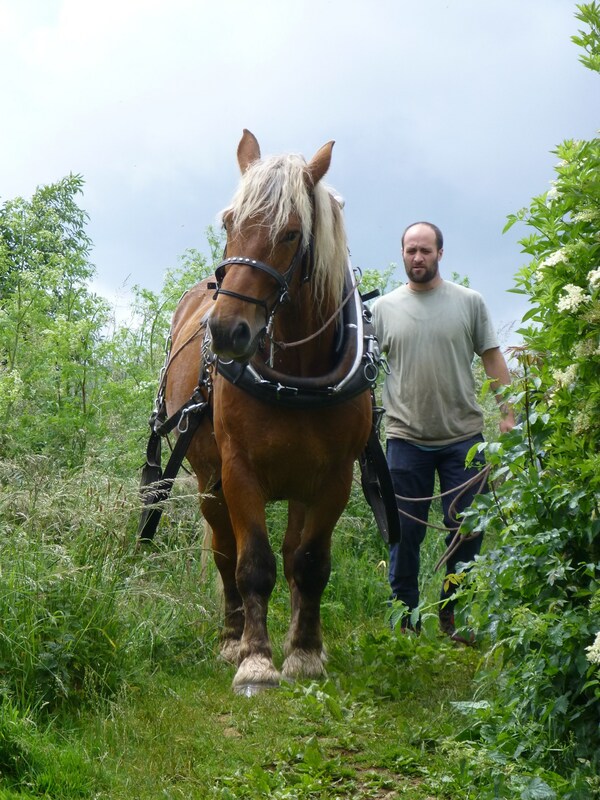 Wherever possible we only use hand tools and no chemicals have been used since 2011 on the hill after the group requested that the Woodland Trust stopped using them on the site. 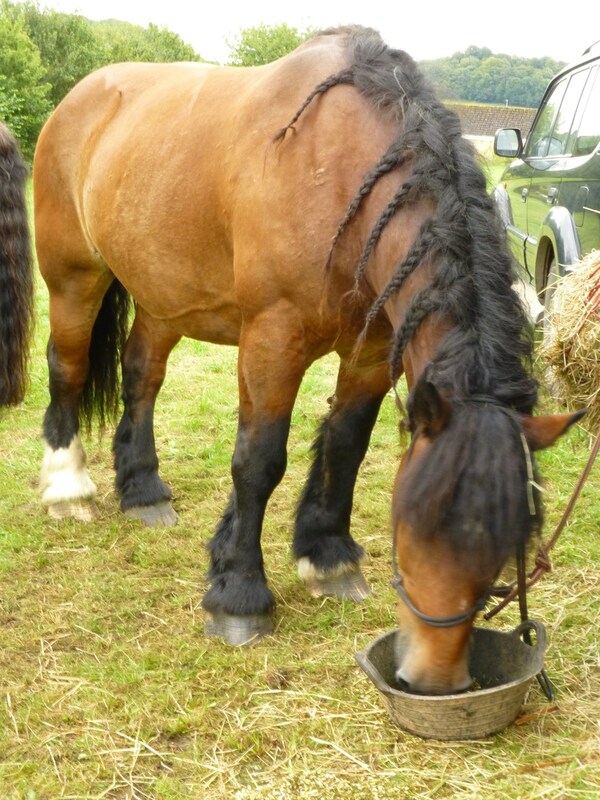 On the Friday there were 4 horses (Kipp, Solo, Beono and William) and bracken rolling was carried out. 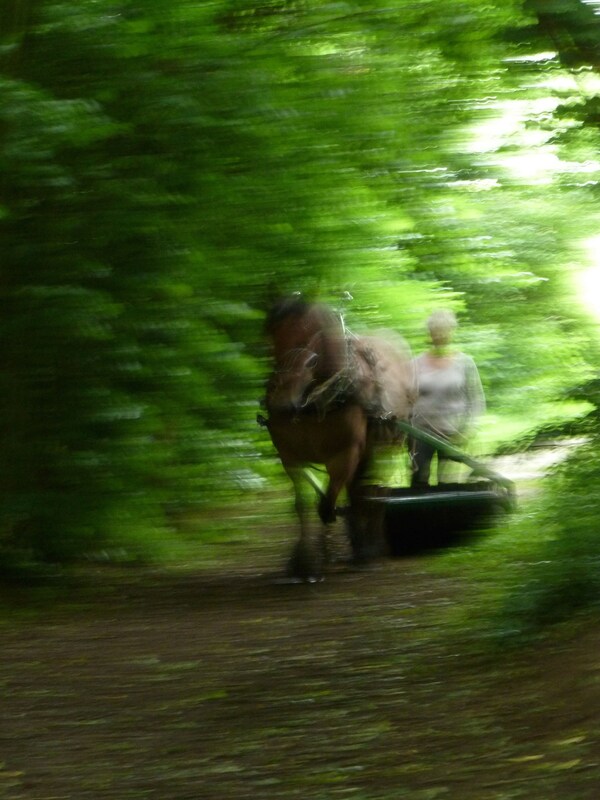 On Saturday Kate with Kipp and Solo extracted the timber from Cooper's Wood. 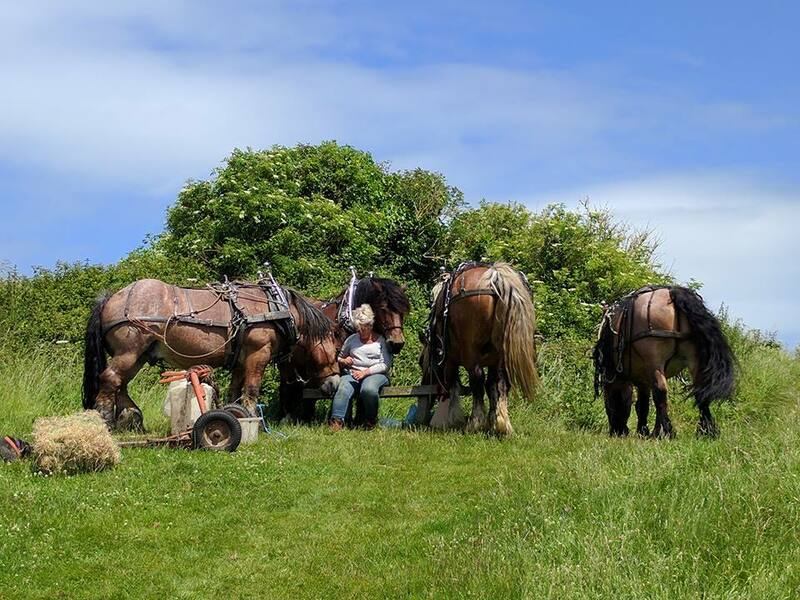 Kate doesn't think we will need the bracken rolled for a few years now but, when it needs doing, she and her horses will be back to do it.